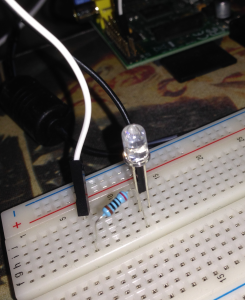 Picture of my simple led circuit connected to the Pi. I decided to make the scope of the problem created for this article as small as possible. Given that the goal will be to create simple circuit diagram consisting of a LED and then to write a program that makes the LED flash for a specified period of time. 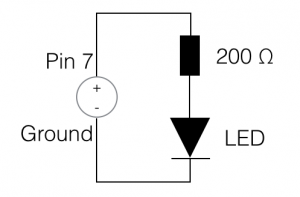 With the Pi, a circuit that will make a LED flash is relatively simple: Consisting of just a LED and resistor. I arbitrarily selected pin 7 on the Pi for this build. I’ve included a diagram of it on this page. As the goal states, the following two implementations do nothing except toggle an LED at half the specified duration (0.5s) and automatically shutoff after 60 seconds. Since Python is the more traditional programming language for the Raspberry Pi, let us start with it. The Rpi.GPIO module I used can be installed via pip. Before you read the code sample, let me point out some things about the implementation. Could it have been done simpler given that the problem was just to make the LED flash for a certain amount of time? Yes, but I wanted to create something of an asynchronous process that could be controlled from outside its execution context. Despite of the amount of codes needed for achieving the same work, did you compare the runtime of these two languages on RaspberryPi? Somehow I heard a saying, that Node.js runtime could consume most of the 512MB RAM and cause the Pi to crash after running for a long time, yet this seemed not happen to Python. “The new Garbage Collector (GC) algorithm in node.js v0.10.x behaves differently than v0.8.x – in that it doesn’t enforce a clean until it is near a memory limit larger than the 512MB in the Pi – this can cause the Pi to crash if left running for a long time”, excerpted from nodered website. I didn’t compare their footprint at all. I’ve not left anything of substance running for a prolonged amount if time in Node on the PI. I’d not seen the post on node-red before you mentioned it since I compiled from source. I did see where they mention (below the quote you used) the use of the “max-old-space-size” argument that would fix the issue. Which is not only shorter than the JS version, but easier to read (no callback hell) and way easier to debug or refactor.